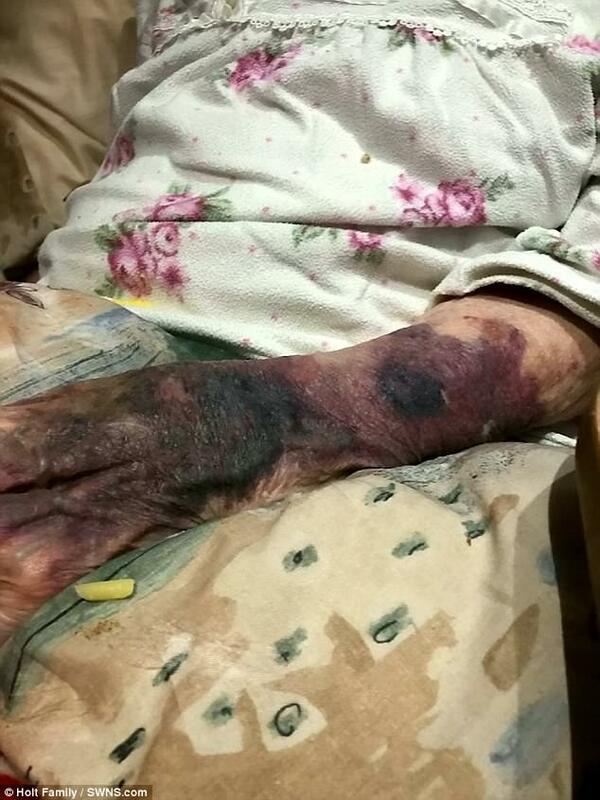 These shocking images show the injuries a 98-year-old great-grandmother suffered after being attacked twice in 30 minutes by a fellow care home resident. 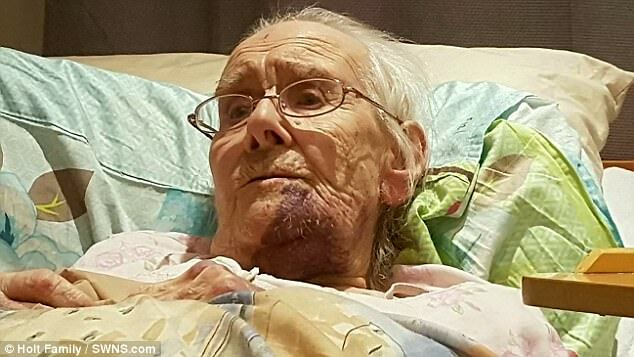 Frail Monica Holt was left with severe bruising and swelling of her face and body after she was assaulted while asleep in her bed. The retired nurse, who struggles to speak, gestured punching movements to her family to explain the brutal incident which is being investigated by police. They claim they weren’t contacted until eight hours after the attack and are now seeking legal action against the home where Mrs. Holt has lived for the last four years. Bosses at Heathercroft Care Home in Warrington, Cheshire – which last year received a ‘requires improvement rating’ – say they are taking the incident ‘very seriously’. 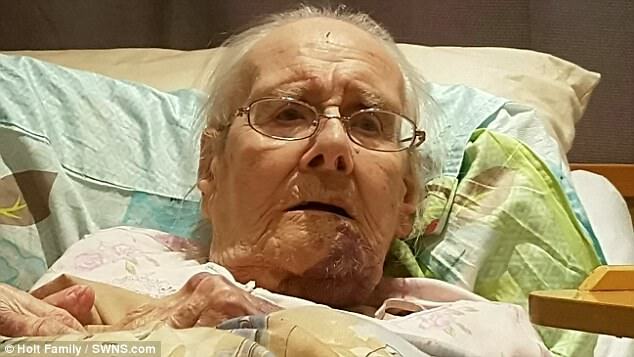 The severe injuries on 98-year-old Monica’s arm are shown in shocking photos released by her family. The attack unfolded at around 4 am while Mrs. Holt, from Lymm, Cheshire, was asleep in her bed at the care home on December 13 last year. 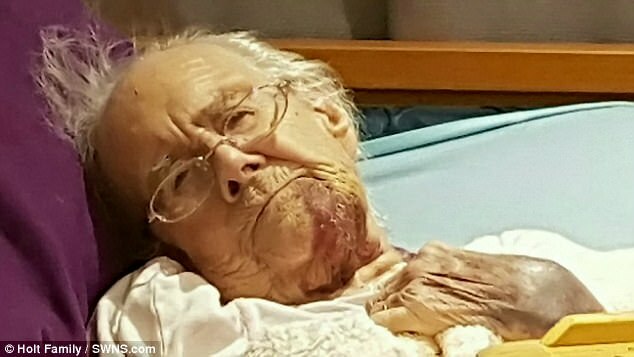 Mrs. Holt’s family decided to share photographs of her injuries after being ‘disgusted’ by the response of the care home so far in the wake of the horrific assault. Her grandson Lance Holt, 46, said: ‘I was disgusted as it’s on her file that I can be contacted 24 hours a day. ‘When they called I was just told she had bruising to her face. When I saw her for the first time I was shocked. ‘My grandmother knows what has happened but she is not in a state where she can sit there and have a conversation with you. Lance says he is fighting for justice for his grandmother who is unable to fight for herself. ‘It’s not about money and it’s not about compensation,’ he added. ‘She is 98 and I’m her power of attorney. She can’t fight for herself. She can’t even have a conversation. ‘If I don’t do anything then I won’t be doing her justice. It’s about fighting for what is right. Lance initially shared the photos on Facebook along with a damning post. It read: ‘This is my grandmother who is 98 years old. 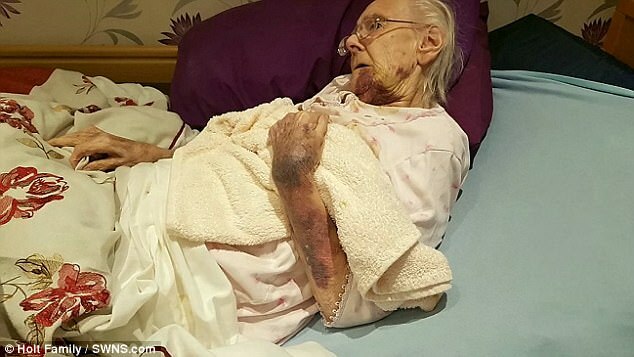 ‘She is 99 in February and was attacked at 4 am while asleep in her bed in the care home where she should have been safe. ‘This was done by another male resident while she was asleep in her bed at 4 am. The family sent a letter of complaint to the 88-bed care home – which specializes in Alzheimer’s care – but say they have not yet received a reply. Mrs. Holt, who is a mum-of-two and has three grandchildren and several great-grandchildren, remains at the care home. The care home had been ordered to improve in December after inspectors found that a ‘significant’ shortage of staff had led to a number of failures. The Care Quality Commission, which regulates care homes, has been informed of the incident and advised Lance to contact the police. Nigel Denny, managing director of Ashberry Healthcare, which is the company in charge of the care home, has confirmed that an investigation is underway. A Cheshire Police spokesman confirmed they have received a report of an assault at the care home and investigations are ongoing.